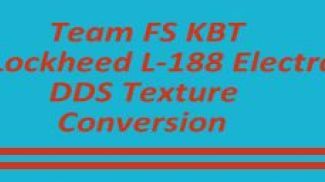 Replacement shared texture files for the Team FS KBT Lockheed L-188 Electra. Original BMP shared textures converted to dds dxt5 format for better frame rates and load times. Total shared texture size saving of more than 80%. Textures only, requires base pack (L-188_ELECTRA_X.ZIP). By Paul Craig. Thank you for downloading these textures, I have converted the majority of these textures into dds dxt5, but some only required to be converted into dds dxt1 format. First delete the "texture" folder with BMP textures, from inside your KBT Electra aircraft folder. Copy & paste the new dds "texture" folder into your KBT Electra aircraft folder. The archive kbtl188ddstextures.zip has 45 files and directories contained within it.